as i mentioned in my last post, i had a "cupcake baking cheer-up a friend date" this weekend which was pretty great. there is something really wonderful about being in the kitchen and working on projects together while you are doing a little soul pouring and then in the end, there is this pretty little sweet product. and let's face it, you can't help but smile when you see cute little cupcake all decked out with pretty frosting and sparkle sugar. we pulled out the baking books and supplies and just started to wing it a bit. 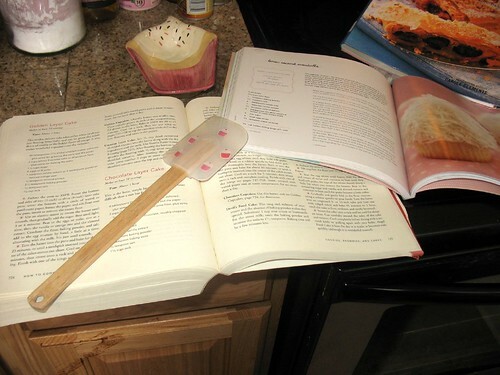 and yes, those are tiny cupcakes on the spatula on top of my cupcake book, next to my cupcake spoon rest...i am a big nerd. 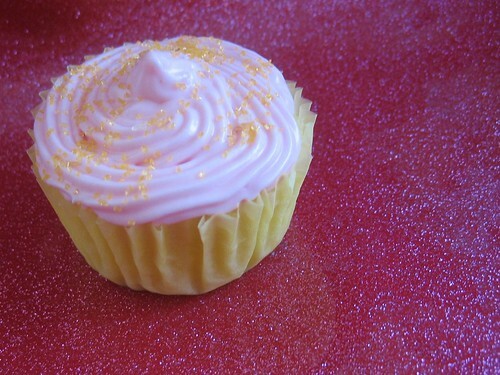 we decided on coconut lime cupcakes (see my last post) and a batch of pink lemon cupcakes. as you can see both recipes are really similar with a few small exceptions, so we really just made a double batch of simple vanilla cupcakes and divided it in half and did the citrus-ing to them and switched up the frostings a bit and the result was two completely different tasting cupcakes that were both really delicious. add the zest and the lemon juice and blend thoroughly. bring cream cheese and butter to room temperature and beat together until creamy. add grenadine one tablespoon at a time. grenadine is a syrup, so it can easily overwhelm your frosting with that syrup-y flavor...just be sure to add it a bit at a time until you get a taste you like. these sort of reminded me of a little cocktail in cupcake form and i really loved them. nothing cures a hung over sunday with a little cocktail cupcake. ps...i promise i will start blogging and making things OTHER than cupcakes soon! Oh, I love you blog... I need to add you to my blog roll!